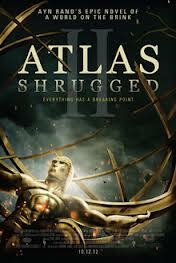 The idea that this movie—and the previous movie Atlas Shrugged I—were kind of boring haunts me a little. I have this idea that the next time I mention to someone that Atlas Shrugged is my favorite book, someone will say: “Really? I saw the movie, and I thought it was kind of boring…sorry.” And that ‘sorry’ will be laced with compassion and condescension. Sorry you wasted your time reading all that, sorry I don’t agree, and sorry, but it just didn’t appeal to me. As a long-time fan of Ayn Rand, and in particular the book Atlas Shrugged, I felt like I was a member of a very select community. National politicians, and world leaders, have spoken about the influence this book, and this author, have had on their lives. Some of them have spoken about the manner in which the premise of the book’s philosophy had a great deal to do with their advancement in life, but most of the people in my inner circle have never heard of Rand or the book. I longed for a movie for decades, so that my non-literary friends could know the joys of leading a life based on philosophy. That is now a reality, but most of my friends haven’t seen the movies, and I don’t encourage them to do so, because they’re kind of boring. Unfortunately, part II was not much better than part I. You will see a new cast, and you will see greater production, but if you’re like me you’ll walk out of the theater as disappointed as you were after the first one. I’ve watched the first movie two and a half times. (I was so disappointed that I couldn’t make it through the movie a third time.) I bought the first one to support the cause, and to give producer John Aglialoro the compliment of my money just for having the fortitude to see this project to fruition. I went into part II with lowered (extremely low) expectations, and I wasn’t disappointed. The production was decent, the cinematography was well done, and the acting was somewhat improved, but it was boring. It was painfully and disappointingly boring. The inevitable question arises, how could you do it better? The answer is I couldn’t. The answer may also be the reason that this project fell through the cracks so many times. No one else thought they could do any better either.